The realistic sound of famous reverb gears in your iPad and iPhone. Includes a large built-in library of the highest quality reverb impulses taken from the most known and outstanding devices and possibility to upload your own impulses of reverb spaces. Intuitive and compact user interface for maximum ease and efficiency. 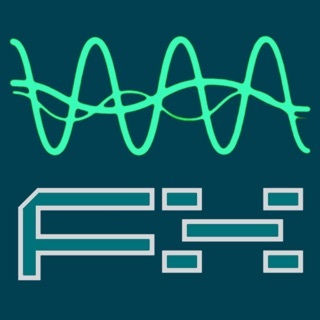 You can use this application together with Inter-App Audio hosts (like a DAW, Recorders or Audio file managers) or with Audiobus for adding studio quality reverberation effects to the sound of other music applications or pre-recorded tracks. AltiSpace can also be used with external audio interfaces for real-time sound processing. Suitable for live performance or in the studio together with other equipment. What is the convolution reverb? Briefly, convolution reverb is based on a process that digitally 'captures' the reverb characteristics of another reverb effects unit or the reverb response of a real acoustic space. It is based on the mathematical convolution operation, and uses a pre-recorded audio sample of the impulse response of the device or space being modeled. The process of convolution multiplies each sample of the audio to be processed (reverberated) with the samples in the impulse response file. ● More than 400 factory presets from 24 actual reverb devices. ● High-quality and fast convolution algorithm with 64 bit operations. ● Low latency for comfortable using at live performance. ● Wide range of reverberation types such as plates, springs, halls, rooms, etc. 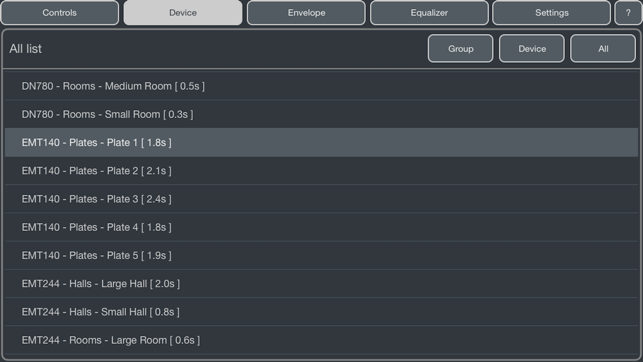 ● Preset hotkeys with possibility to save current sample and all its parameters. ● Convenient choice sample by device name, reverb type or in complete list. ● All processing parameters are stored for each sample. ● Pre/post parametric equalizer with cut-off LP/HP filters. ● Possibility to construct the envelope (like ADSR) for device sample. ● Changing offset from beginning of sample (start time of sample). 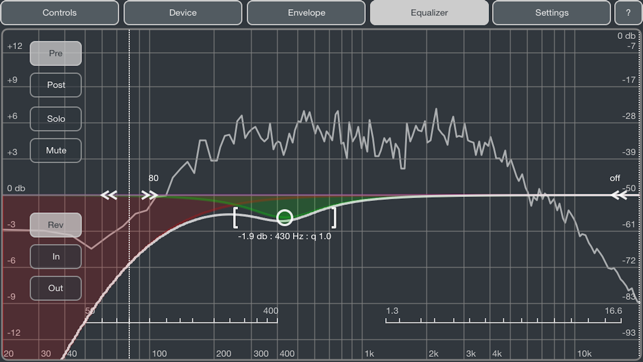 ● Adjusting stereo width and modulation for reverb output. ● Additional mode 'Reverb only output' for use with DAW and mixing consoles. 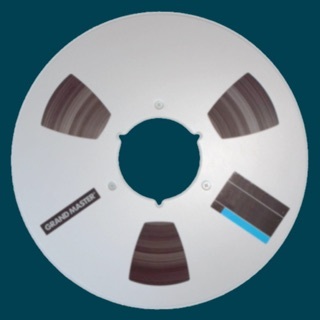 ● Possibility to upload additional samples in different audio formats. ● Uploading samples thru Web access, audio clipboard, from another app or thru iTunes. 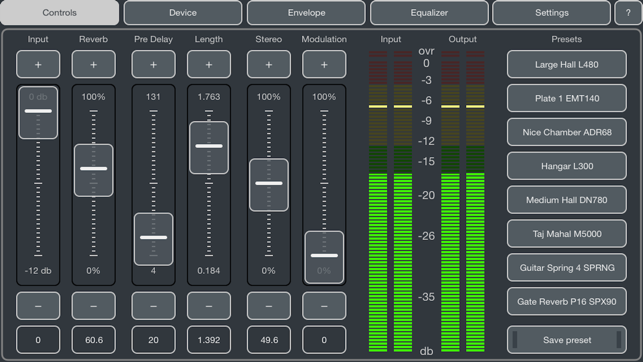 ● Detailed application description with an overview of famous reverb equipment. 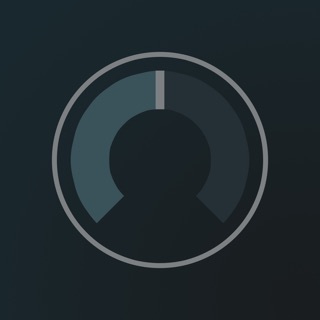 ● Supports Inter-App audio and Audiobus 3 with "State Saving" feature. Third generation of iPad or fifth generation of iPhone and higher is recommended (especially with Inter-app audio or Audiobus). ● iOS 11 compatibility update. ● Minor bugs were fixed. This is a really fantastic reverb app with a lot of great presets and it is very easy to customize your own personal atmospheres! 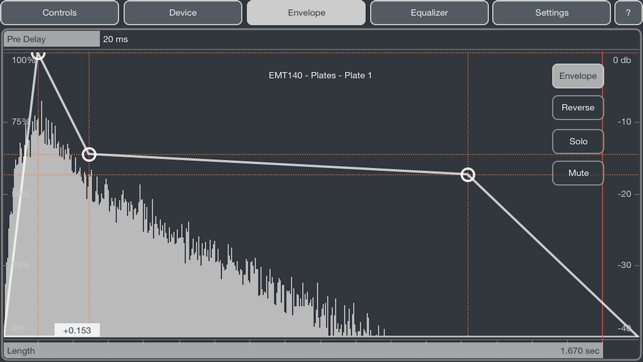 The envelope and equalizer sections help enhance how easy it is to make custom reverbs and save them for later recall. The only reason I gave this app 4 stars instead if 5 is due to an issue with latency and pops in the live audio. I have to set my DAW's latency to 1024 to eliminate the popping sound. If I leave the latence at 512 it will pop during live play, but the track mixdown will be clean...no pops. The developer is very nice and we are currently trying to resolve this issue. Other than that I really love this reverb app!!! I find these effects sound great. I use them live to sweeten my flute sound as a send from Cubasis. I had to delete it and re-install it to get it working after updating to iOS 11. Latest updates take this up to an even higher power.